Plant a Vege Garden: Even if you only have a small outdoor space you can create a simple vegetable patch with the kids. If you have no yard, you can still plant seeds in some pots and even decorate the pots! A little tip: Get fast growing plants so the kids can see the results quickly. Camp Out: Why not set up a tent in the backyard and have a night out camping? And if the weather is poor, set it up inside! Baking Day: Plan a day of baking with your kids - and the best part is, you get to eat the results! 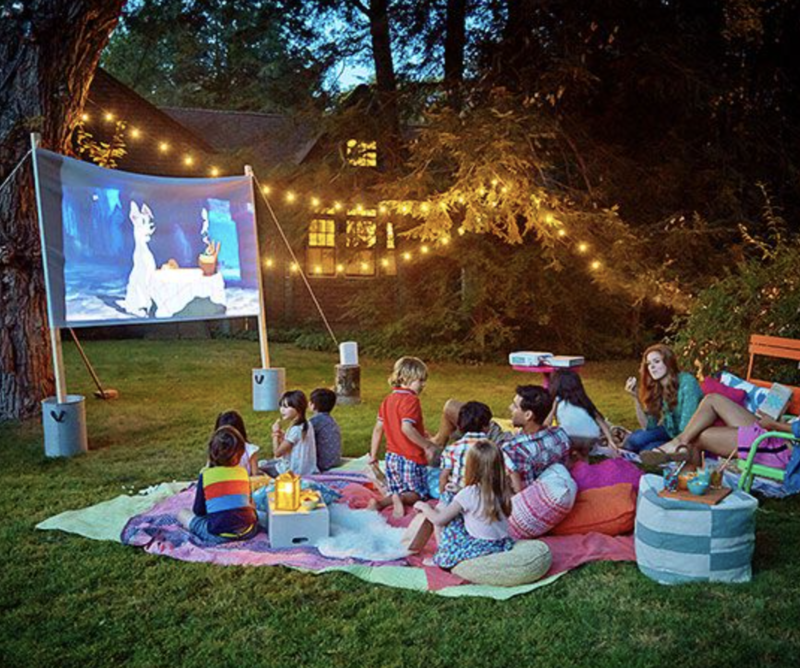 Movie Night: Move a TV outside for a night and create an outdoor cinema under the stars! Include popcorn and some fairy lights for the ultimate outdoor experience. And if you want a big screen or to invite some friends, many companies do outdoor screen hire! Treasure Hunt: Hide some things around the house or yard, and then create a treasure map to lead your kids to an exhilarating adventure with a prize at the end. Have an Adventure: Take public transport and go on an adventure and see where you end up! Most kids love buses and trains, something we forget as grown ups! Enjoy a day at the Beach: This is an easy one, and the only expense is the fuel and the snacks! Dig for Fossils: Buy some cheap dinosaur toys/bones, and bury them in your hard and give them a plastic spade for digging. They will love uncovering their fossils! Act it out: Write a play with your kids they can act out - you can also let them make costumes and sets for the play. Take a tour around your city: Be a tourist for a day! Even after years living in the same area, you will be surprised at all of the new things you can find. Go Fish! Head out for an afternoon of fishing, and then cook the fish for dinner! Do a Colour theme day: Choose a colour, and then everything that day has to be that colour. For example, if you choose green - you wear green clothes, eat green coloured food, make green paintings etc. There are so many more ideas if you get that thinking cap on! Enjoy these holidays everyone, before you know it, the kids will be back at school.